Experience a life at one of the finest apartment complexes in Saugus, MA. With our spacious 1, 2 and 3 bedroom floor plan options, you are sure to find the perfect home to suit all of your needs. Plus, if you’re looking to stay active, our vast selection of newly upgraded community amenities feature virtual golf, a sparkling pool, an indoor basketball court, and a gym with 24-hour access. We are actively accepting applications - call or stop by our leasing office today! As a bonus, the community office will happily accept resident package deliveries! The Residences at Stevens Pond is conveniently located just minutes from US-1, I-95 and I-93 for a quick trip to Boston. Our community is also surrounded by the beautiful Breakheart Reservation, making for a serene and quaint setting. Plus, we are just walking distance away from elementary schools in the neighborhood. With our recently upgraded amenities, spacious floor plan selection, and convenience to Boston, The Residences at Stevens Pond is the home you have been dreaming of. Give us a call at (781) 232-7088 with any questions, schedule a tour of a one, two or three bedroom apartment, and apply online today to find your perfect fit. 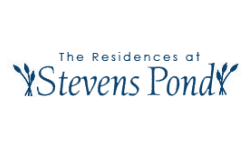 We look forward to helping you make The Residences at Stevens Pond your next home! BREATHE EASY - YOUâRE HOME NOW.